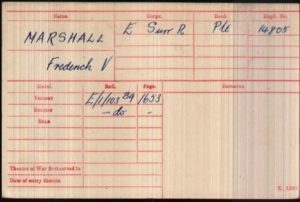 Frederick Victor Marshall was born in the 3rd quarter of 1887 in Wotton, Surrey to coachman John Marshall and Martha Briggs Marshall nee Stokes. 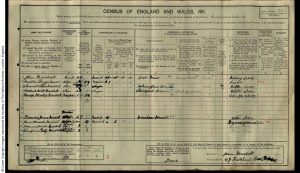 At the time of the 1891 Census, the family lived at Broadmoor Cottage, Wotton, Surrey. John was working as a coachman and Martha was at home. The household further comprised of their children: agricultural labourer William, stable boy Albert, Henry, Alice Kate, Samuel Stokes, Francis James, Rose Emily, Mary, Frederick Victor and Louise E. Marshall. John´s mother Mary Ann Marshall also lived in the cottage. At the time of the 1901 Census, the family lived at 69 Orchard Road in Dorking. John Marshall was working as a coachman and Martha Briggs Marshall was at home. The household further comprised of their children: Rose Emily, Frederick, Louise and Daisy. At the time of the 1911 Census, the family lived at 47 Falkland Road in Dorking. John was working as a cab driver and Martha was at home. Of their children: Samuel Stokes was working as a chauffeur, Frederick was a bricklayer´s labourer and Daisy was at school. The household further comprised of John´s son Francis James, his wife Jane Hannah and their children Francis Christian and Winifred Patty. The accomodation had four rooms. Martha stated that she had given birth to 15 children of whom 11 were still alive. Frederick married Violet Amelia Jeffries, by Banns, on the 4th of January 1914 at St Martin´s church in Dorking. At the time of their marriage Frederick was working as a labourer and lived at 47 Falkland Road in Dorking. Violet lived at 29 Walton Road in Dorking. Violet Jeffries was born about 1894 in Bromley, Hertfordshire to labourer Frederick Jeffries. She was baptised on the 18th of February 1894 at Holy Trinity church, Horsham, Sussex. 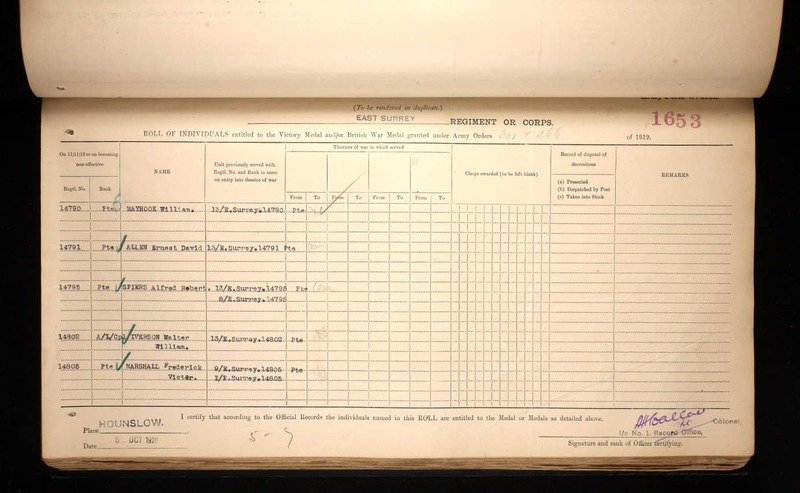 At the time of the 1911 Census, Violet lived with her adoptive parents, brick setter, Frederick Etherington and Jane Etherington at 29 Walton Road in Dorking. At this time Violet was working as a domestic servant. 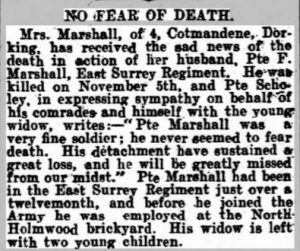 Frederick and Violet had two children: Margaret V. Marshall born in the 3rd quarter of 1914, Winifred N. Marshall, both born in the 4th quarter of 1916 in the Registration District of Dorking, Surrey. 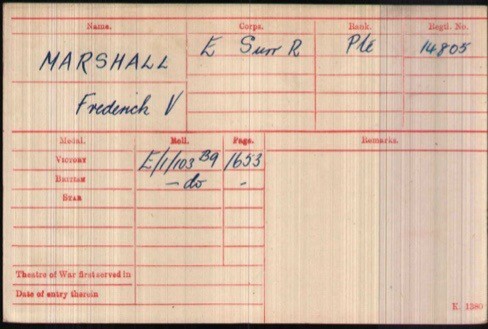 Private Frederick Marshall enlisted into the army at Kingston upon Thames. His regiment was the East Surrey Regiment, and he was a member of the first Battalion. This wasn’t a Territorial Army formation but one of the regular army formations. 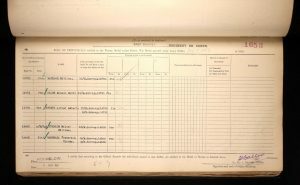 On January 12th 1916 this merged into the 95th Brigade in the 5th division. The 5th division took over a section of front line between St Laurent Blangy and the southern edge of Vimy Ridge, in front of Arras in March 1916. The Attacks on High Wood, The Battle of Guillemont, The Battle of Flers-Courcelette, The Battle of Morval, The Battle of Le Transloy these were all phases of the battle of the Somme. By 5th October 1916, the Division had left the Somme and was holding a quieter line near Festubert. There was a constant threat from enemy artillery and sniper fire, but in comparison with the Somme, it was a relatively peaceful. However this is most likely where Private Frederick Marshall was killed despite the tranquillity of the front. 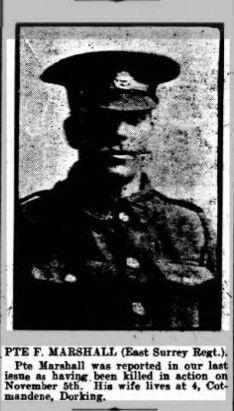 Frederick Victor Marshall died on the 5th of November 1916 in France. Before he joined the Army he had been employed at the North Holmwood brickyard. Fredrick Marshall is commemorated on the Loos Memorial, France. 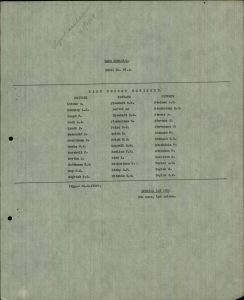 Frederick Victor´s wife Violet re-married Frank Leslie Prince Marwood in the 4th quarter of 1917 in the Registration District of Dorking, Surrey. She later lived at 31 Wathen Road in Dorking. 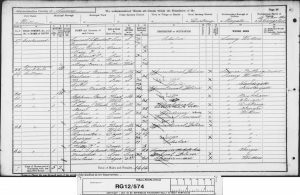 Frederick´s father John Marshall was born about 1847 in Dorking, Surrey to agricultural labourer William Marshall, born about 1821 in Dorking, Surrey, and Mary Ann Marshall, born about 1816 in Dorking, Surrey. John Marshall was baptised on the 10th of October 1847 in the Poor Law Union of Dorking. At the time of the baptism the family lived at Logmore. At the time of the 1871 Census, widowed Mary Marshall lived with her son John Marshall at Broadmoor, Wotton, Surrey. John was working as an agricultural labourer. 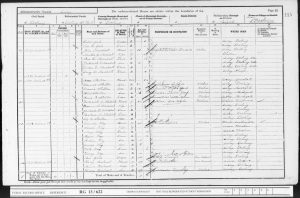 Frederick´s mother Martha Briggs Stokes was born on the 31st of March 1852 in London, Middlesex to William Stokes and Martha Stokes. Martha was baptised on the 1st of August 1852 at Redenhall with Harleston, Norfolk, England. John and Martha married, by Banns, on the 23rd of December 1871 at St Paul´s church, Hook. At the time of the marriage John Marshall lived at Wotton and was working as a labourer. Martha lived in the Parish of Kingston. 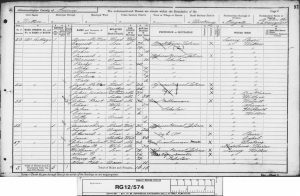 Frederick Victor Marshall had fourteen siblings of whom twelve are known: William J. Marshall born about 1873; Albert G. Marshall born about 1874; Ellen M. Marshall born about 1876; Ada A. Marshall born about 1877; Henry A. Marshall born about 1879; Alice Kate Marshall born about 1880; Samuel Stokes Marshall born about 1882; Francis James Marshall born about 1884; Rose Emily born about 1885; Mary F. Marshall born about 1886; Louise E. Marshall born about 1890, all born in Wotton, Surrey and Daisy Dorothy Marshall born about 1897 in Abinger, Surrey. At the time of the 1881 Census, the family lived at Broadmoor, Wotton. John Marshall was working as an agricultural labourer and Martha. The household further comprised of John´s mother Mary Ann Marshall.